Sleep apnea is a sleep condition that can affect your overall health in a serious way if not treated. Sleep apnea sufferers can experience hundreds of episodes per night in which their breathing pauses or briefly stops. They often snore and wake up gasping for air throughout the night. While quality of sleep is certainly disturbed if you have sleep apnea, the consequences don’t stop there. Sleep apnea has been linked to daytime fatigue, mood swings and headaches as well as high blood pressure, diabetes, cardiovascular disease, weight gain and much more. As part of our dental services at ConfiDenT, we have dentists who are uniquely trained to treat sleep apnea using proven oral appliance therapies. If you have been diagnosed with mild to moderate sleep apnea, a nighttime oral appliance may be your answer to a better night’s sleep and a healthier you. Oral appliances are especially beneficial for patients who are unable to tolerate CPAP machines for sleep apnea. 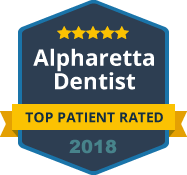 Our Alpharetta dentists use FDA approved appliances that are not only proven to reduce sleep apnea episodes, but they are also custom fit for ideal comfort through the night. Oral appliance therapy is used to treat a wide range of dental-related issues that occur during nighttime sleep, including loud snoring, teeth grinding and sleep apnea. The oral appliance allows the jaw to rest in a more open position. This opens up the airway and prevents the throat muscles and surrounding walls of tissues from collapsing, which in turn prevents snoring. With the airway open, patients also receive an adequate supply of oxygen throughout the night. A dental appliance or night guard can provide even further benefits, as it protects the teeth from harmful habits such as grinding or clenching and reduces the likelihood of common TMJ symptoms associated with bruxism. At ConfiDenT, we understand the profound cause and effect relationship between your dental health and your sleep habits. If you or your partner have sleep apnea or snore loudly, we invite you to learn about your treatment options at our Alpharetta office. We are happy to work alongside your physician or sleep specialist to ensure oral appliance therapy is the most appropriate course of action. Contact us today to get relief from snoring and protect yourself against the serious drawbacks of sleep apnea.